Environmental Economics: "Fishermen Can Make Their Catch Count for Red Snapper Fishery with iSnapper"
CORPUS CHRISTI, Texas — With the announcement by federal fisheries officials that this summer’s federal recreational Gulf of Mexico Red Snapper season would be the shortest ever at just three days, fishermen are invited to join the effort to collect more robust catch data with the goal of providing a longer season through better science. By downloading and using iSnapper, a mobile application created by the Center for Sportfish Science and Conservation (CSSC) at the Harte Research Institute (HRI) for Gulf of Mexico Studies, anglers can take an active role in helping to secure the long-term sustainability of this prized Gulf of Mexico fishery. 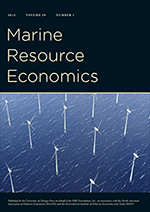 The ability to collect timely and accurate catch data from recreational fishermen is a major challenge to fisheries management, which is designed to keep fish populations stable and prevent overfishing that can diminish a species’ population. Because of these problems, the Red Snapper quota for the recreational sector includes a 20 percent buffer to ensure that quota is not exceeded, which would violate federal laws. With more accurate data sourced directly from fishermen in near-real time, this buffer could be reduced or even eliminated, allowing a greater amount of fish to be harvested. The CSSC previously launched iSnapper as a pilot project with charter for-hire captains in 2011 to see if app technology could provide a faster and more accurate means of reporting catch. That app was an overwhelming success, and this new version of iSnapper opens the door to a much wider audience of recreational fishermen who want to aid in better fisheries management. Here is the link to the NMFS funded report: http://sportfishcenter.org/sites/default/files/2015_iSnapper_Results.pdf. Will someone out the economist(s) who is working on the demand model with these data?